Karthik Krishna Amavasya is considered to be the most auspicious day to perform Laxmi puja. After the fierce battle of lord Rama and Raavan in Lanka, Laxmi puja was performed as a symbol of lord Rama’s victory over Ravan. The return of lord Rama to Ayodhya was celebrated with great pomp and show. Shree Rama was coronated and Laxmi puja was performed by the people of Ayodhya. Laxmi pujan is also commonly referred to as the Deepawali or Diwali puja which is also conducted in honor of Mata Sita. According to the legend, Goddess Laxmi came in the form of Mata Sita and by performing Laxmi pooja, Goddess Laxmi is pleased and she bestows her devotees with blessings and wealth. As houses are adorned and cleaned during Diwali, Goddess Laxmi brings in joy, prosperity and ensures that her worshippers live in peace and a state of well-being. A magnificent light of knowledge is said to be unfold on this day. This self-enlightenment is asserted through the gleaming lamps that illuminate the abode of the worshippers. Prayers to Devi Dhana Lakshmi – adorer is endowed cash and riches. Prayers to Devi Gaja Lakshmi – adorer is endowed mobile properties i.e. vehicles. Prayers to Devi Adi Lakshmi – adorer is endowed endless prosperity. Prayers to Devi Vijay Lakshmi – adorer is endowed success and bravery. Prayers to Devi Dhairya Lakshmi – adorer is endowed patience and objectiveness. Prayers to Devi Dhaanya Lakshmi – adorer is endowed food, nourishment and health. Prayers to Devi Vidya Lakshmi – adorer is endowed knowledge. Prayers to Devi Santan Lakshmi – adorer is endowed kids and family. 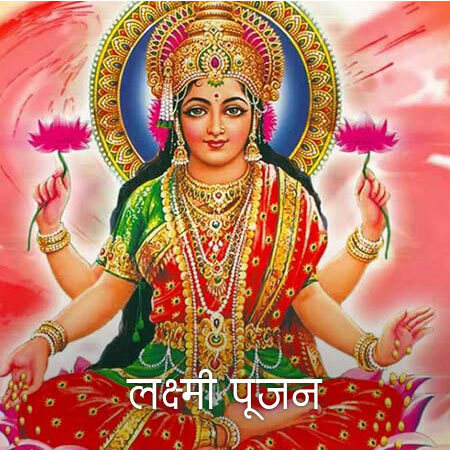 Thus, performing a Laxmi Puja helps defend a true adorer from failures, poverty, hunger, debts, loss of wealth and pecuniary crunches and difficulties. 1. Keep all these things together at one place. 2. Place chawki on your place of puja. Spread red cloth on it. 3. Place photo/idol of Goddess Lakshmi, Saraswati and Lord Ganesha. 4. Place 3 heaps of raw rice in front of Goddess Lakshmi photo for Lord Vishnu, Kuber and Indra. 5. Light a lamp to start puja. This lamp should be kept lit overnight. Also light dhoop stick. 6. Pray Lord Ganesha to come and remove all obstacles during Lakshmi puja. Put tilak of roli and akshat on forehead of Lord Ganesha. Offer scent, flowers, dhoop, sweets (naivedya) and earthen lamp to Lord Ganesha. 7. Now start Lakshmi puja. Put Tilak of roli and rice on forehead of Goddess Lakshmi. Offer scent, flowers, dhoop, sweets and earthen lamp (deepak) to Goddess Lakshmi. Now offer coriander seeds, cotton seeds, dry whole turmeric, siver coin, currency notes, supari and seed of lotus flower to Goddess Lakshmi. 8. Pray to Lord Vishnu to come along with Goddess Lakshmi. Offer scent, flower, dhoop, sweets, fruits and earthen lamp to Lord Vishnu. 9. Pray to Lord Kuber to come along with Goddess Lakshmi and give wealth. Do worship of lord Kuber by offering earthen lamp, scent, flowers, dhoop and sweets. 10. Pray to Lord Indra to come along with Goddess Lakshmi and give prosperity. Do worship of Lord Indra by offering scent, flowers, dhoop, sweets and earthen lamp. 11. Now do worship of Goddess Saraswati. Put tilak on forehead of Goddess Saraswati and put akshat on it. Offer scent, flowers, dhoop, sweets and earthen lamp. Pray to get divine knowledge and guidance on life path. 12. Now do worship of Elephants in photo. Offer a pair of sugarcane to elephants of Goddess Lakshmi. 13. Do Lakshmi Arti after this Puja. Great Blog! Fantastic blog article. I truly appreciate this post.Much thanks again. Will read on… Check cheat codes to win games.